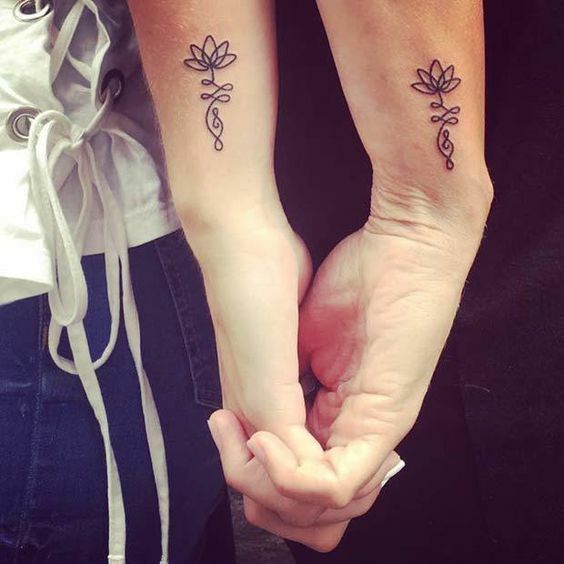 Floral tattoos have a charm of their own. However, this tattoo is not exactly floral as you can see beautiful twists and turns in this which makes it look like something else. It can have different meanings for different people. Now, this is an unfilled tattoo and looks super clean. 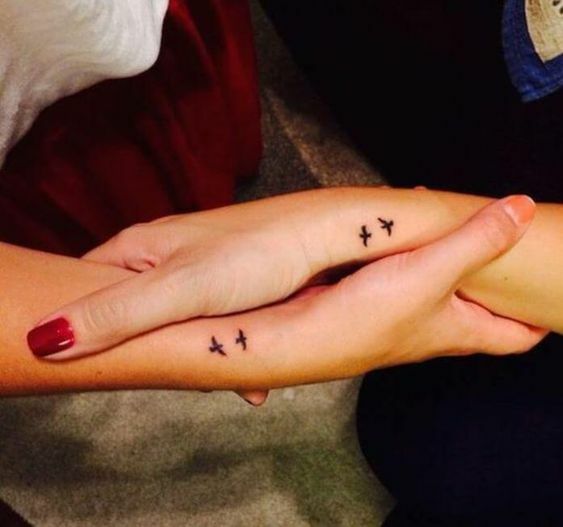 A tattoo that is drawn half on two people and completes while joining the hands or whatever is super creative. A tattoo remains incomplete until and unless the other person joins it with the rest half of it. This tattoo is an example of such a tattoo where you can see two different shapes of the same tattoo. When it comes to boys for getting a tattoo, they like to be creative and don't like much of the mainstream lovey-dovey stuff like girls. 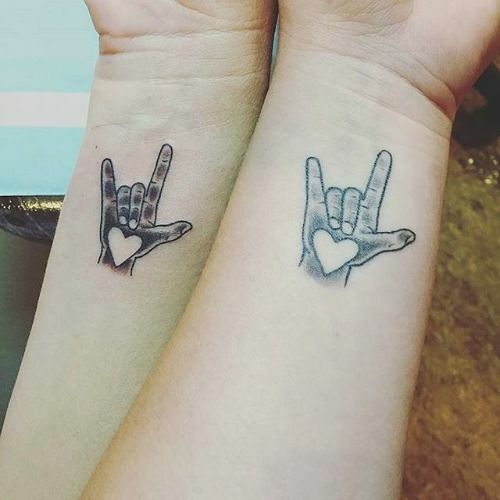 Now, here is a perfect example for that where you can see two matching tattoos that are in the rock shape with a heart inside the hand. All the music lovers would understand this tattoo. Gorgeous flower filled with beautiful colors look extremely precious and people are obsessed with those. 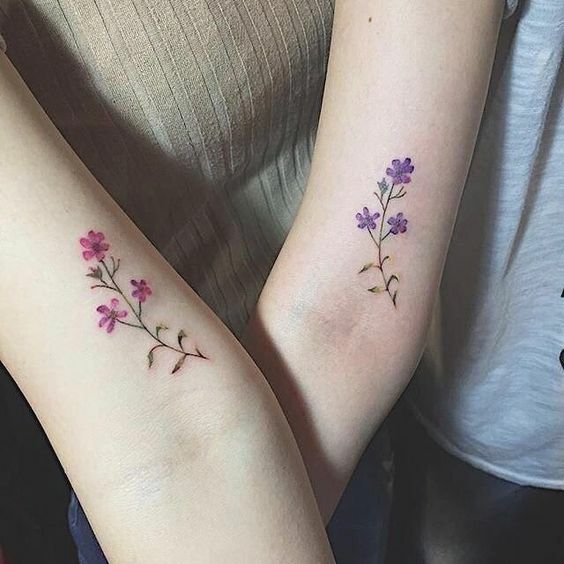 Have a look at this gorgeous matching tattoo for mother and daughter where you can see two exactly same flowers drawn on both of their arms but with different colors. 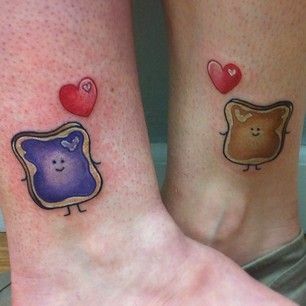 Matching tattoos look extremely beautiful and can melt anybody's heart. 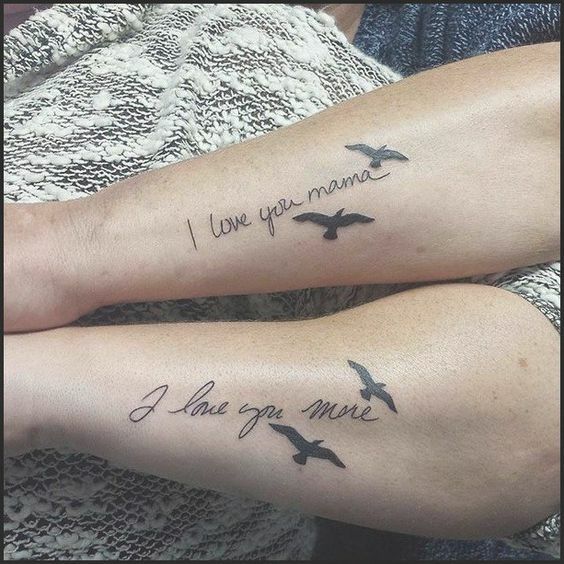 So, have a look at this matching tattoo for mother and son which has a beautiful design with LOVE written inside it. 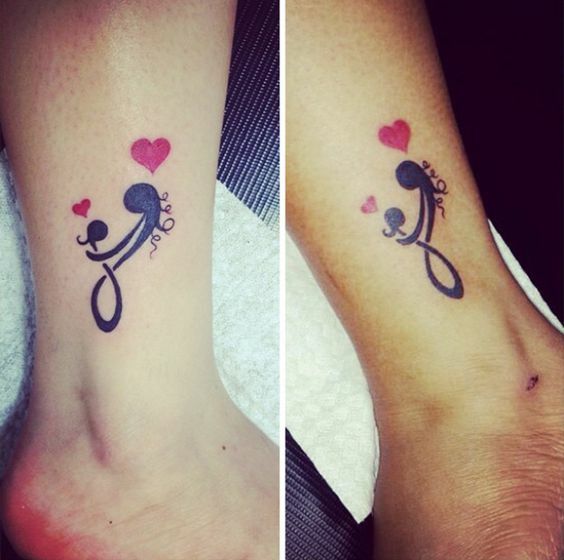 This tattoo can be made for anyone and not just specifically mothers. One word tattoos always look the best and have a really deep meaning behind them. Boys tend to be more creative with their tattoos and make sure they look amazing. 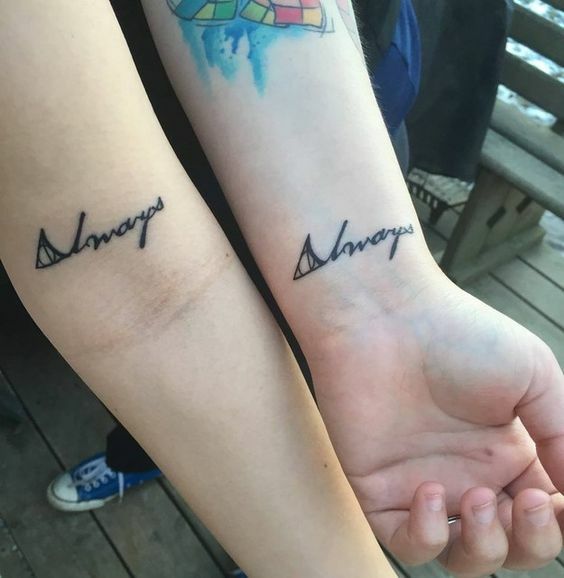 Look at this amazing matching tattoo of mother-son which says Always but in a beautiful font that looks amazing. Tattoos don't always have to be the ones that are already widely famous and everybody seems to be having them. Sometimes, a little creativity is all we need to create a masterpiece. 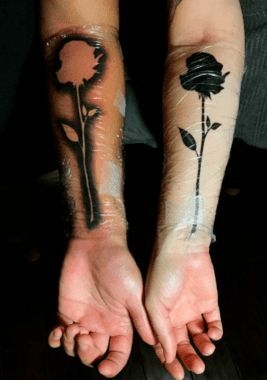 Have a look at this lovely blackout rose tattoo for mother and son which looks stunning. You must have seen most of the tattoos that have no color and are black, right? Well, colored tattoos are not that bad either and they look lovely. 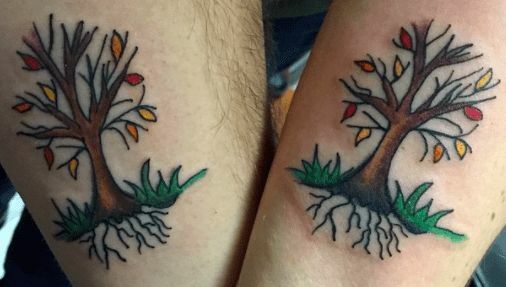 Look at this beautiful colored matching tattoos of mother and son where you can a tree with grass, roots and all things lovely. Who says boys can't show love for their mother and write lovely words over their arms? Well, here is one perfect example that not only can prove your love but also looks really good. 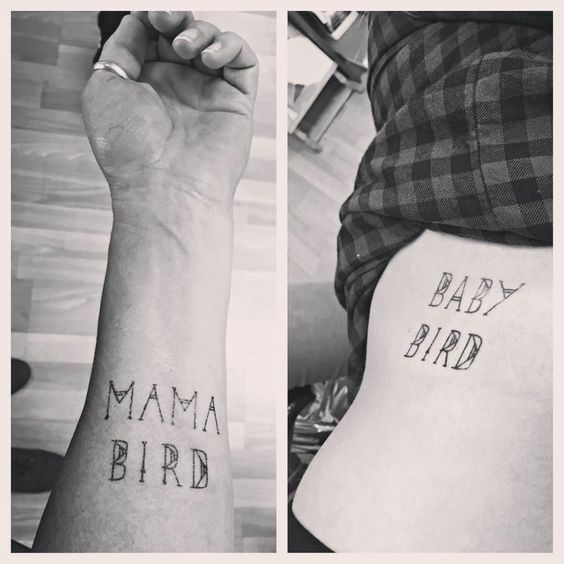 The son has a tattoo "Mom, I love you" whereas the mother has the tattoo "I love you more". Mothers and sons have a very bubbly and cute relationship where most of the mothers are also pretty much more attached to their sons. 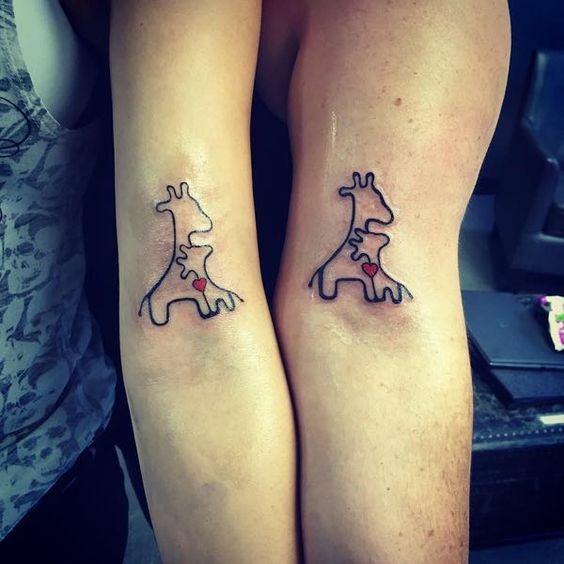 So, how beautiful is this matching tattoo for mother and son which has a big and a small giraffe hugging each with a cute red heart in between them? Getting figure tattooed represents a lot of affection and has a pretty deep meaning. They also look super beautiful if drawn with a good concept. Now, look at how beautiful this tattoo looks where you can see a girl is sitting on a swing whereas there is a red heart at the side. Mothers have a special bond with their sons which remains forever. 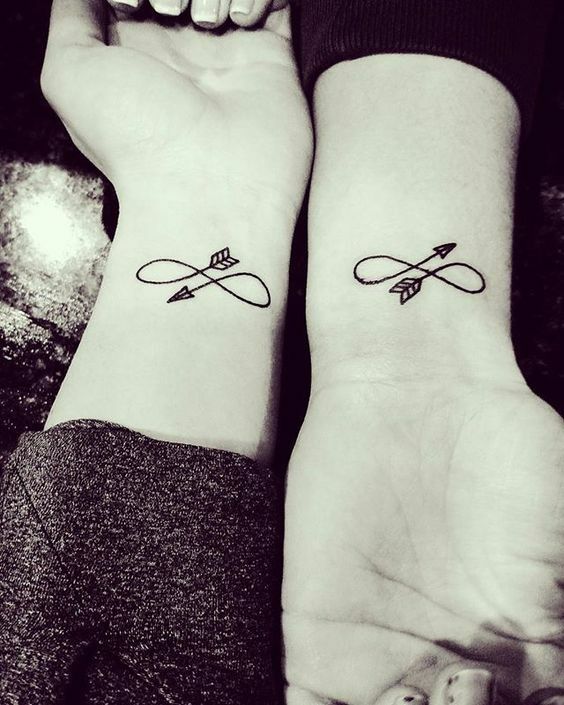 How beautiful is this tattoo of two arrows on mother and son? 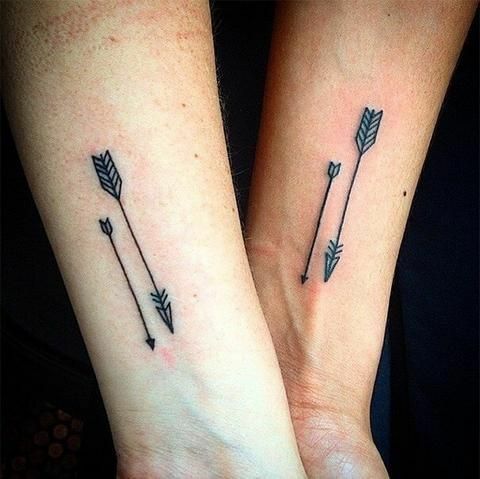 The tattoo looks super neat and has one bigger arrow and a small arrow with it which looks quite beautiful. 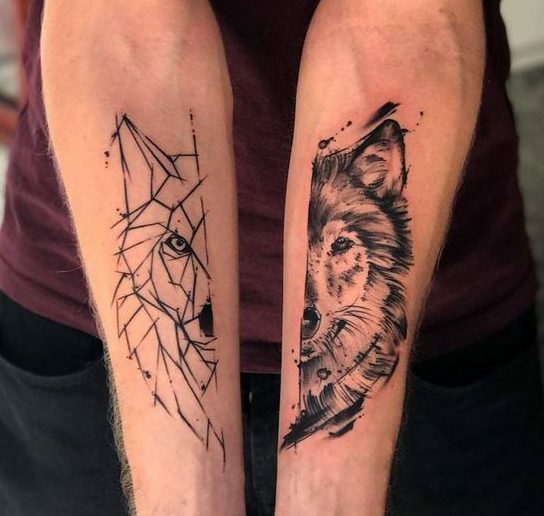 We all love tattoos that are unique and look a little different than the ones we keep seeing people getting over and over. 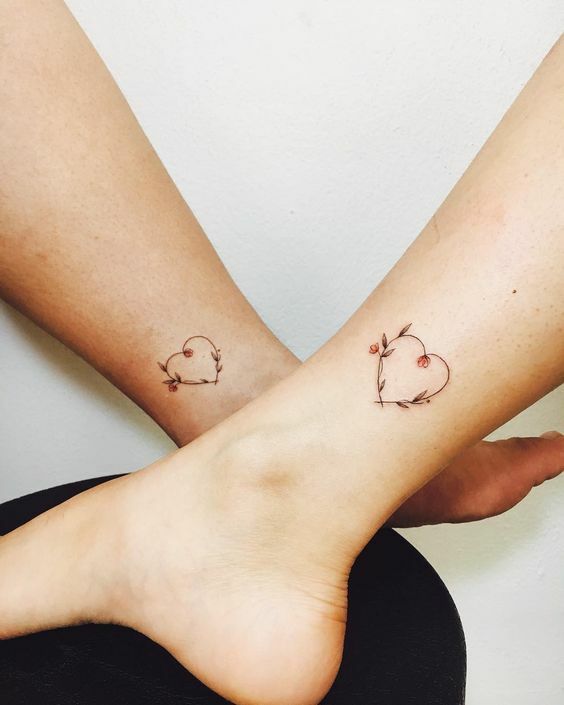 Here comes a unique and creative tattoo that is perfect for mother and son which has thumbprints in the shape of a heart. It looks very lovely. 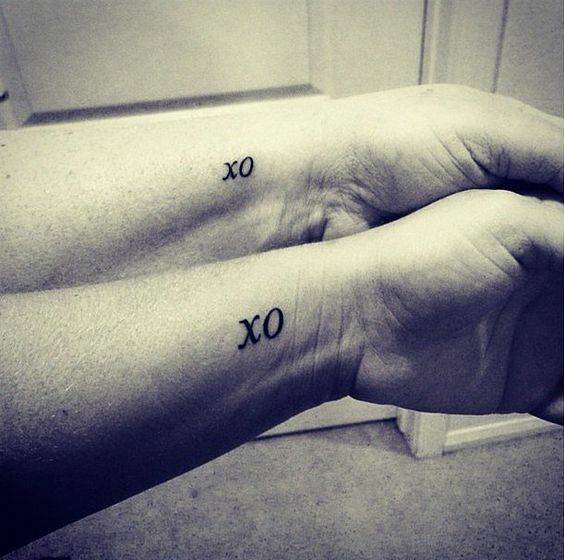 Matching tattoos always look quite beautiful and they for sure represent the love between the two people who got them. So, for a mother and son, here is yet another beautiful tattoo where you can see a beautiful spiral symbol which has three tiny hearts above it. On one side they're colored whereas on the other they're not. How cute is is for a mother that her son gets a tattoo for her? 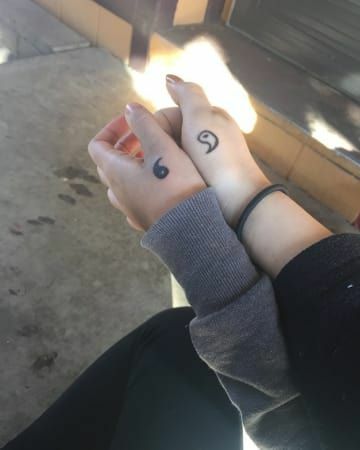 This is one of the most beautiful feelings and when the tattoos are matching, they look super adorable. 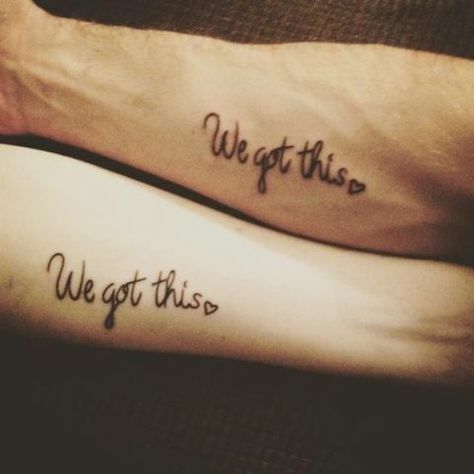 Look at this matching tattoo for mother and son that have gotten the anchors tattoo. We all love a little bit of colored tattoos as they are more prominent and are a source of positive vibes, right? 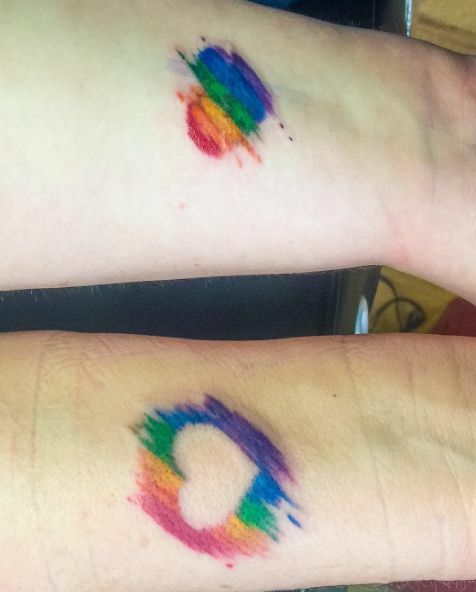 Now have a look at this gorgeous mother daughter tattoo where you can see two hearts with the rainbow colors. One heart is filled inside whereas other has colors outside. Tattoos have a very special way of telling someone how much you adore them if it's done for someone. 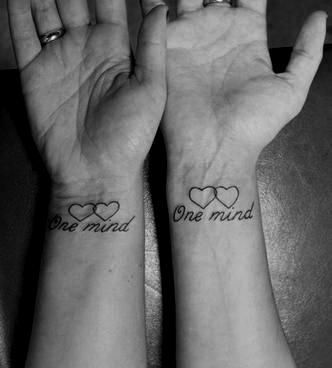 Now, have a look at this beautiful tattoo which are double hearts with "One mind" written beneath them. 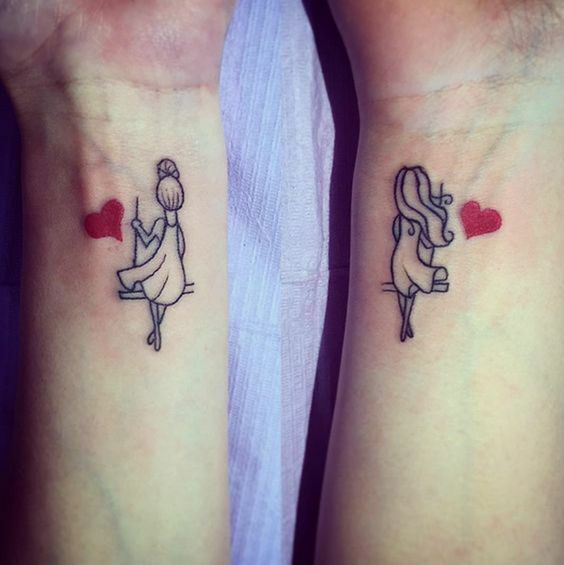 This is a very cute tattoo for mothers and daughters. Mothers and daughter have a love that knows no bounds and no force on earth can separate them or take the love out of each other. 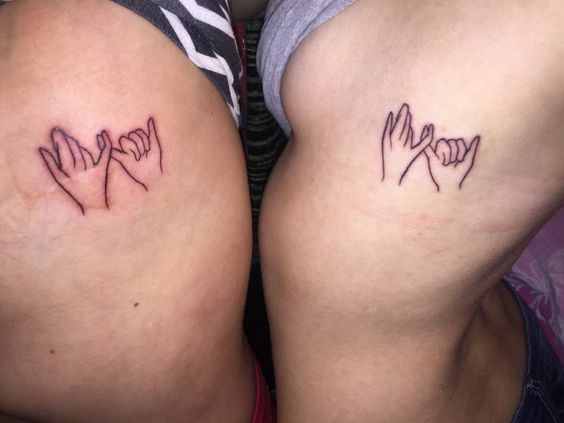 Here comes another tattoo for your inspiration which is a promise where two pinky fingers are crossing each other which means a promise. A mom is the best friend of a daughter and she is always there for her no matter what. Mother is a figure that stands by her daughter like a rock even when the whole world has abandoned her. It is always a good idea to show how much you care for your mother. This is one tattoo that can help you do that. Dandelion are adored by everyone in real and people love blowing them in the air. However, have you thought how you can get them tattooed? 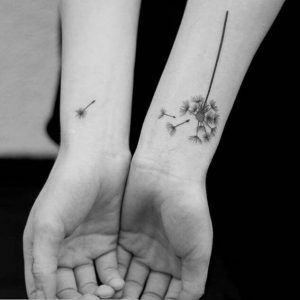 Well, here is a perfect idea where you can see a dandelion with its one seed fur flying on the other side of the arm. 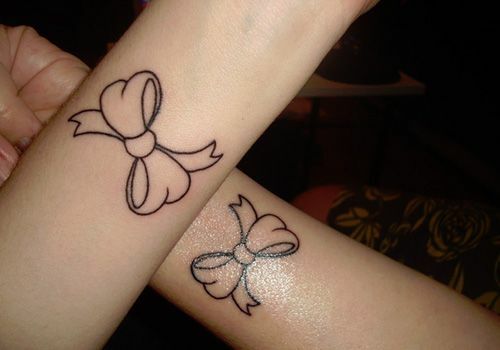 Here comes another beautiful tattoo which is actually a super cute bow. 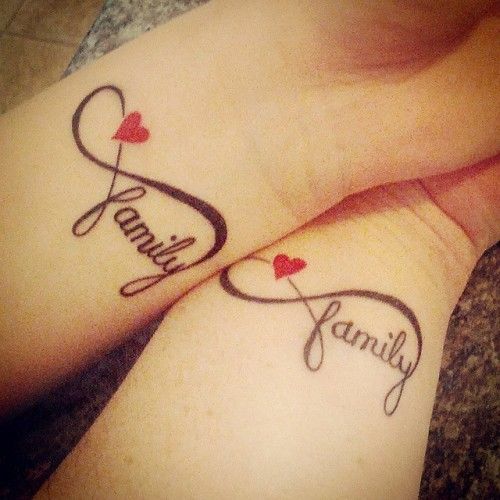 Mother and daughter have this matching tattoo on their arms which looks very lovely. It is perfect for those people who don't like anything written over their bodies and prefer symbols. Colors add a whole new meaning and they sure make everything looks striking. 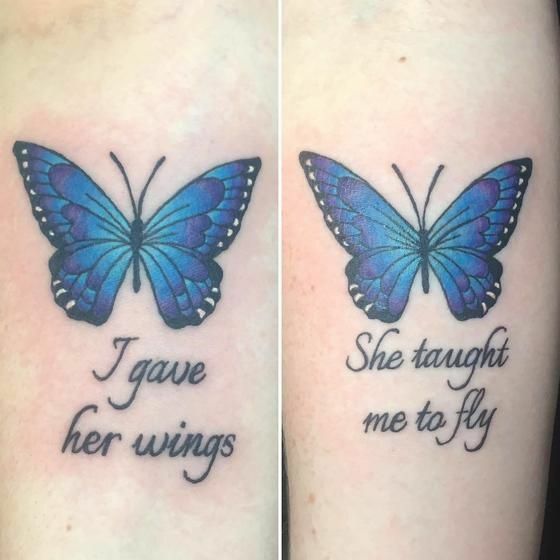 This is a super stunning tattoo for mother and daughter that has two beautiful blue butterflies with something written below them. One tattoo says "I gave her wings" whereas the other one says "She taught me to fly". We all are a fan of butterflies because of how beautiful they look and their ravishing colours, right? Butterflies also have a deep meaning in the tattoo world which is why most people like getting them done. 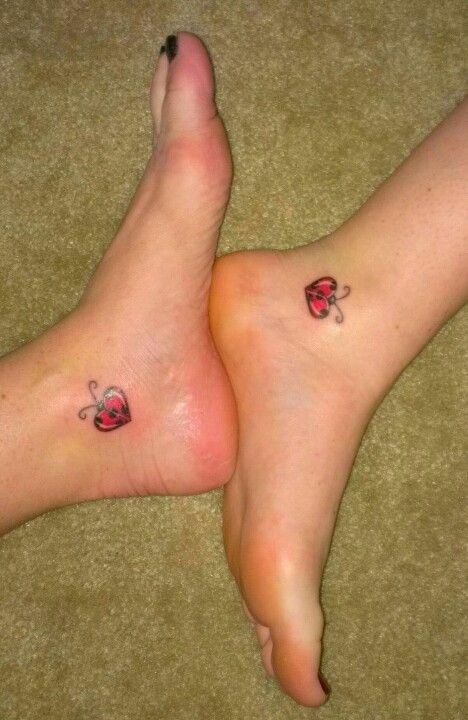 Now, here is a beautiful tattoo of matching butterflies for mother and daughter. 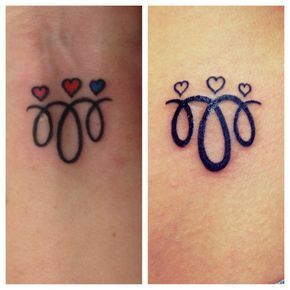 Here is another matching tattoo for mother and daughter on a wrist that looks extremely beautiful with all those colors. This is a tattoo of a rose in the middle of a heart. 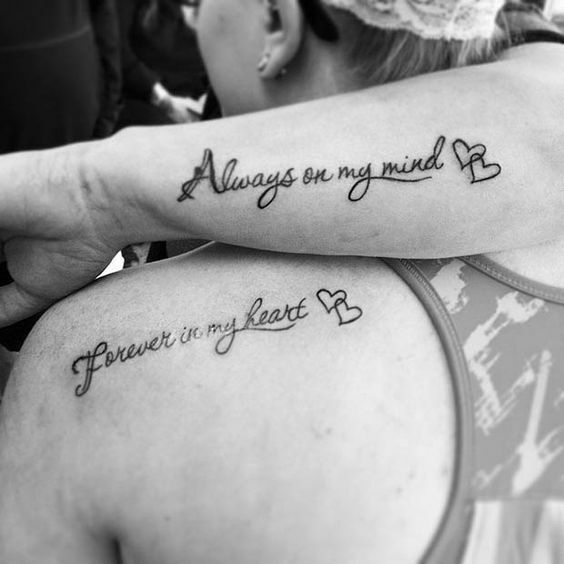 The words mother and daughter have been written at the side of each heart. 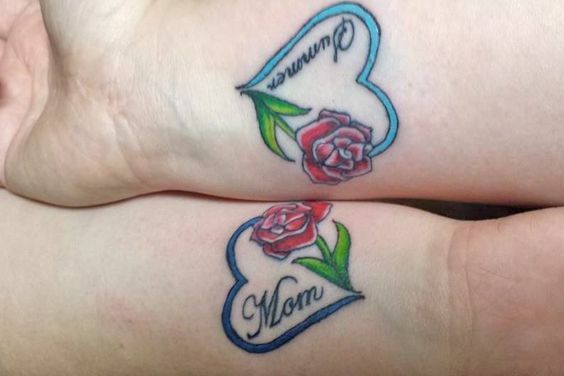 A mother-daughter relationship is too precious for words so most people like to get matching tattoos of their loved ones. 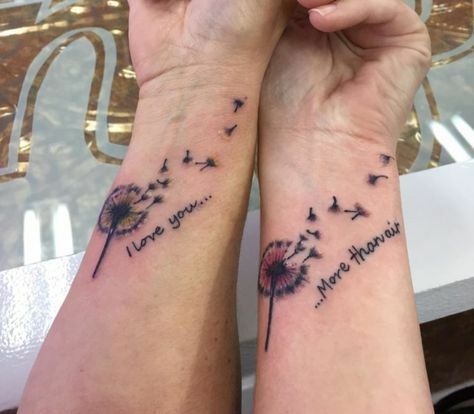 This is a mother-daughter tattoo where you can see Mom and daughter written with the beautiful hearts on each of their arms. Symbols as tattoos are always special as they have a hidden meaning that only the people who get tattoo know. However, tattoos that have written phrases are more than special. 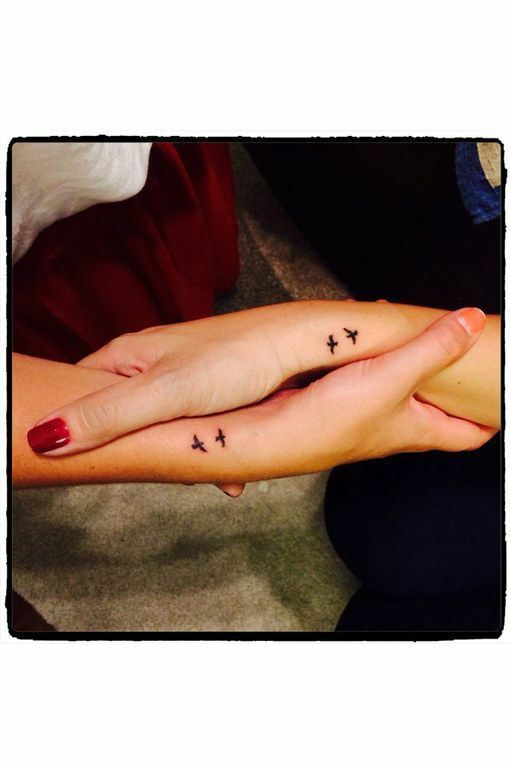 Now, have a look at this beautiful tattoo on mother and daughter that depicts their real love. Tattoos are an amazing way to show someone what you actually feel for them. TAttoos that have something written in them are even more special as you get to know what it is actually about. Look at this beautiful tattoo of a dandelion which have been made on mother and daughter with beautiful wordings. Mothers and daughters have a connection that is extremely beautiful and remains forever no matter come what may. 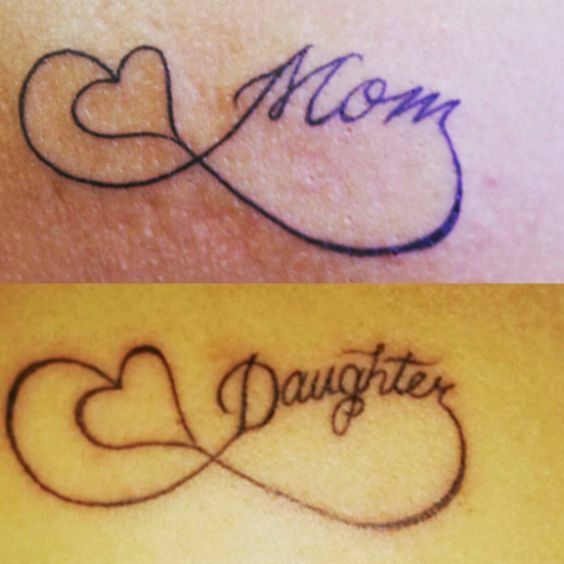 Look at this gorgeous tattoo that a mother and daughter can get it on their arms or their feet and flaunt their love to the world. Tattoos always have some sort of meaning behind them whereas some are just symbols while some are words. 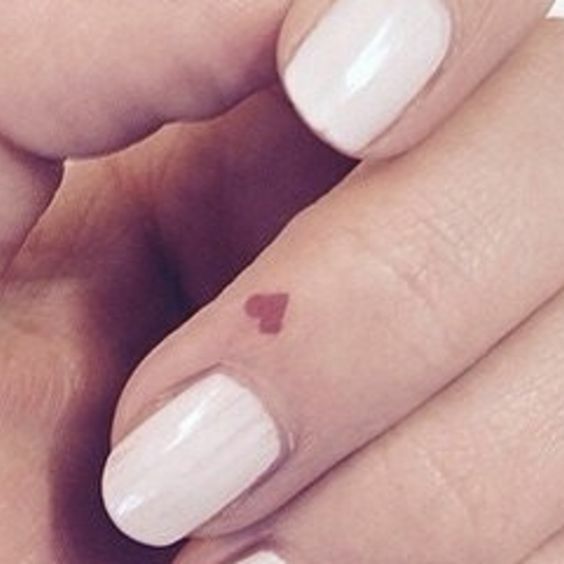 Tattoos that look super cute and relatable can catch anyone's attention in no time. 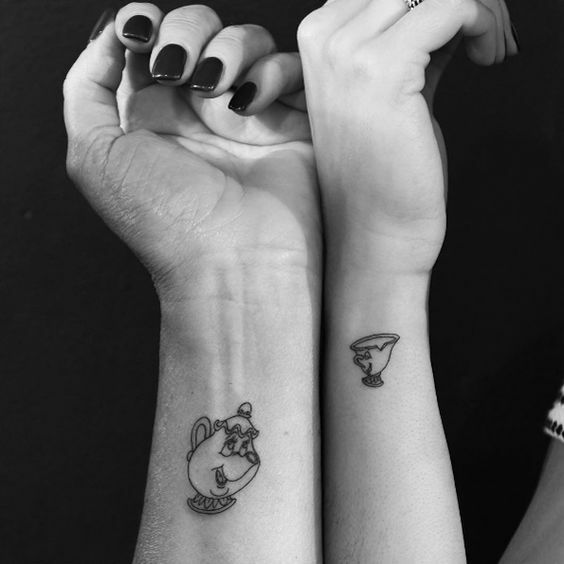 Look at this cutest tattoo for a mother an daughter where one has a teapot and the other has a cup. 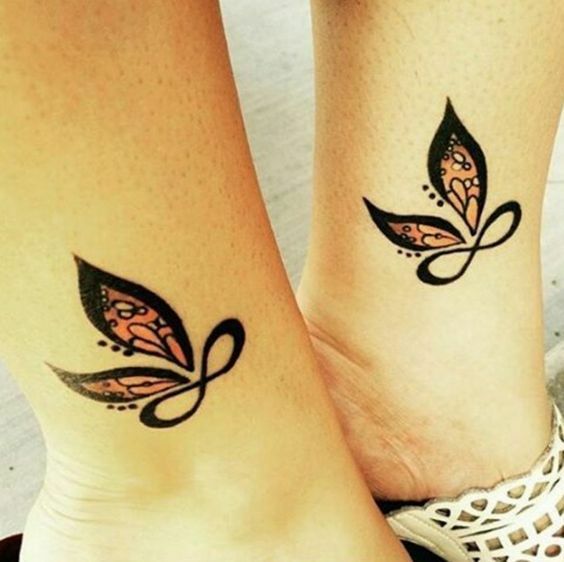 We know how much infinity tattoos are adored by everyone and people love getting them inked with this symbol. Infinity means for a lifetime and beyond that so people like to get this tattooed to show their loved ones how much they love each other. Birds are another thing that people love getting tattooed on their bodies whether it may be smaller in size or bigger. 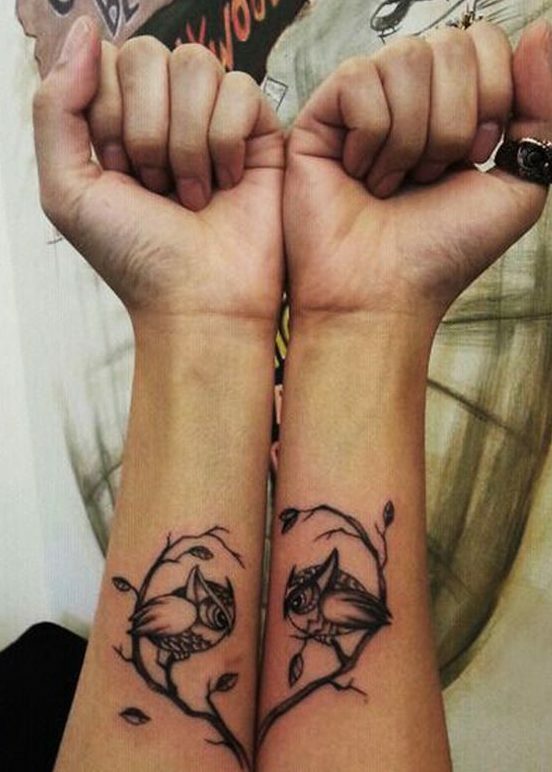 Have a look at this beautiful tattoo on mother and daughter of cute tiny little two birds that look the most beautiful. Tattoos can be made on any part of the body. Some people like short phrases while there are some people who like a lot of stuff written. 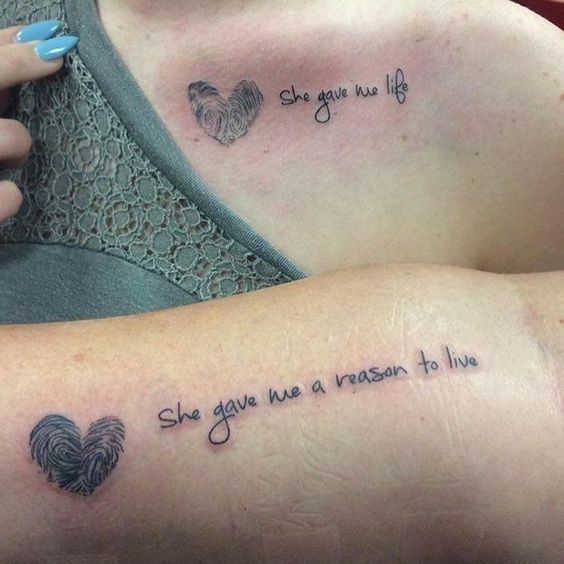 Look at this cute tattoo which says "She gave me life" and the other tattoo says "She gave me a reason to live". Here is a tattoo for all those people who like tiny and delicate stuff. 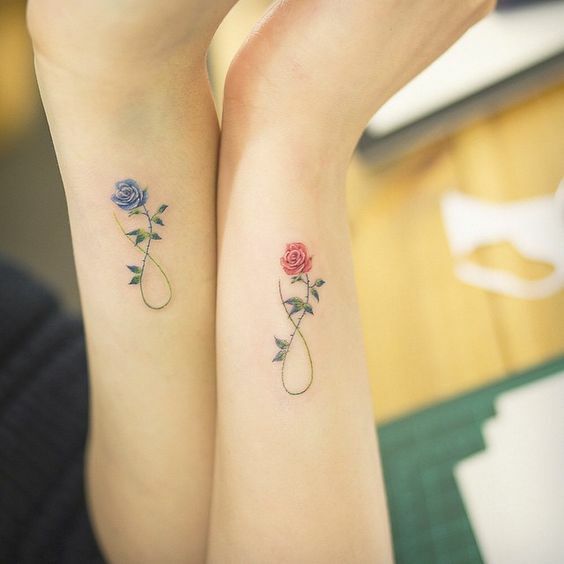 This is a super beautiful matching mother-daughter tattoo where you can see two roses with two different colors on the arms of mother and daughter that looks lovely. Tattoos that reflect your feelings and have written words over them instead of symbols are extremely special and impressive. How gorgeous is this tattoo which has beautiful words written on the arm of mother and daughter. 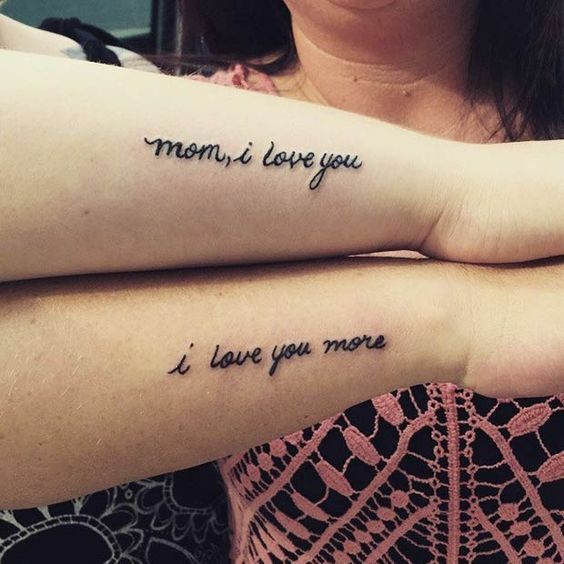 It says"I love you mama" and the other arm has "I love you more". 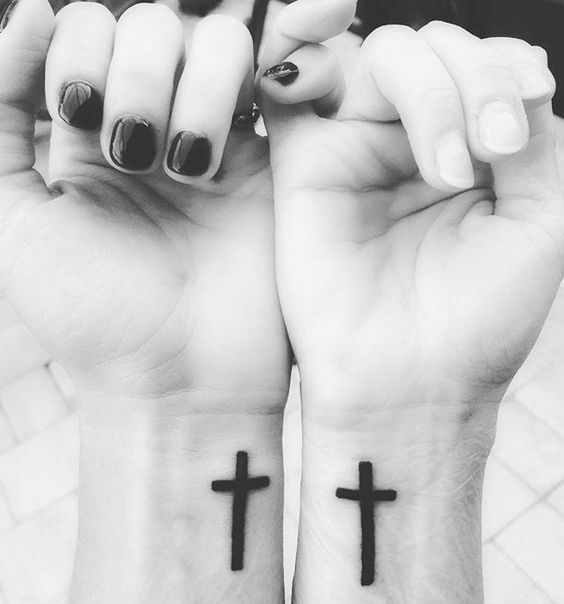 I have already talked about how some cute symbols can actually make a great pair of tattoos for a mother and daughter. Moreover, they have some really deep meaning behind them which makes them even more special. 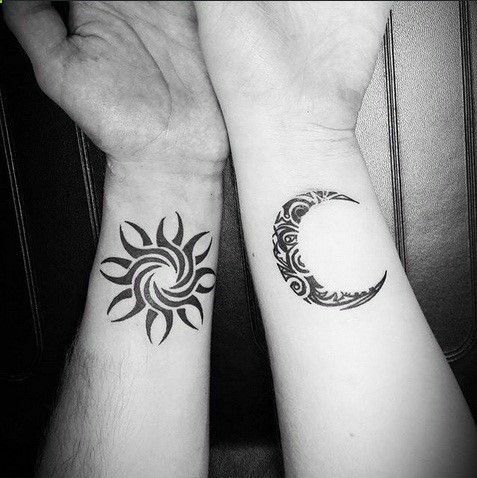 This is another brilliant tattoo idea for mother and daughter which is a sun and a moon. We have seen tons of people getting infinity tattoos as they are a symbol for a lifetime related to something. Peo[e usually like getting it done for the people they love. 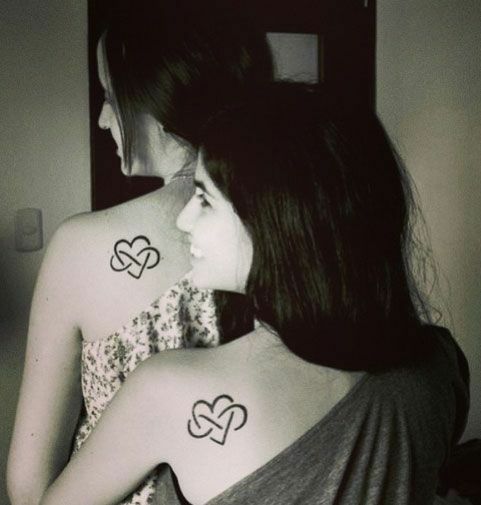 Now, for an unbreakable bond like a mother and daughter, here's one great tattoo that is a heart and has an infinity sign in the middle. How cool is that? A family is the most important thing to a person as they are always there for their fellow family members no matter what. Mothers and daughters adore each other way too much and are lifetime companions. 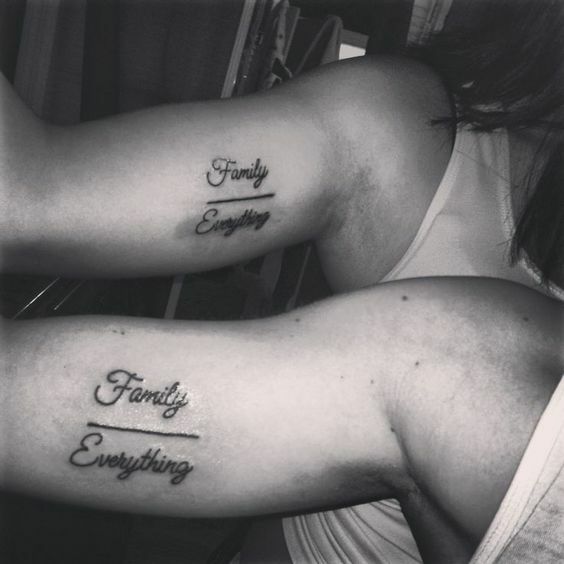 This is another beautiful tattoo which says "family" with a tiny red heart in between. 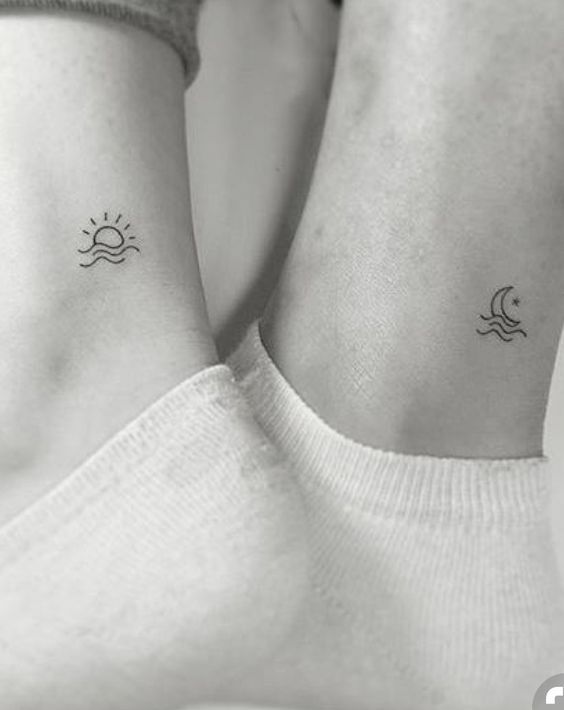 Here is yet another minimalistic tattoo example for those mothers and daughter who like minimal stuff. This is a super delicate tattoo of a heart with some floral pattern over it. This looks very appealing to the eyes and works perfect for matching tattoo. Who says you cant get anything written on your feet as it won'y look good? Well, tattoos on feet look adorable too if they're in the right place. 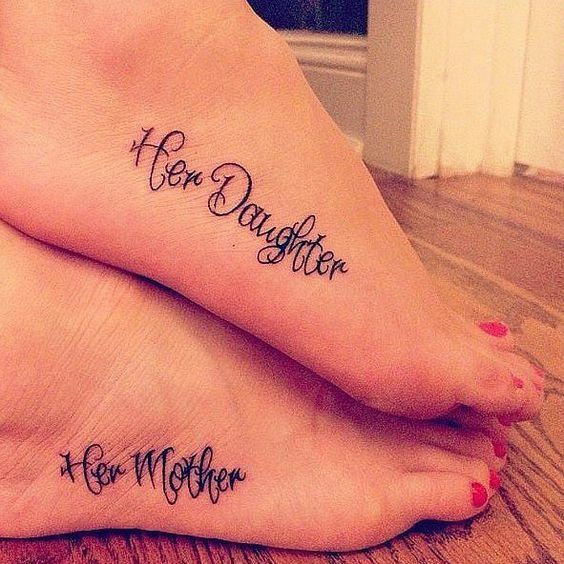 Now, look at this tattoo that has no symbol however beautiful words have been written with beautiful font that says "Her mother" and "Her daughter". 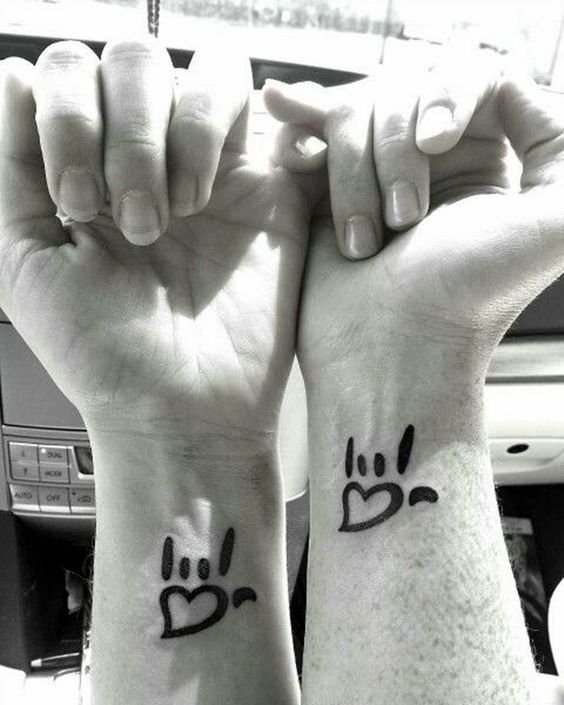 How stunning is this tattoo on the wrist of mother and daughter? 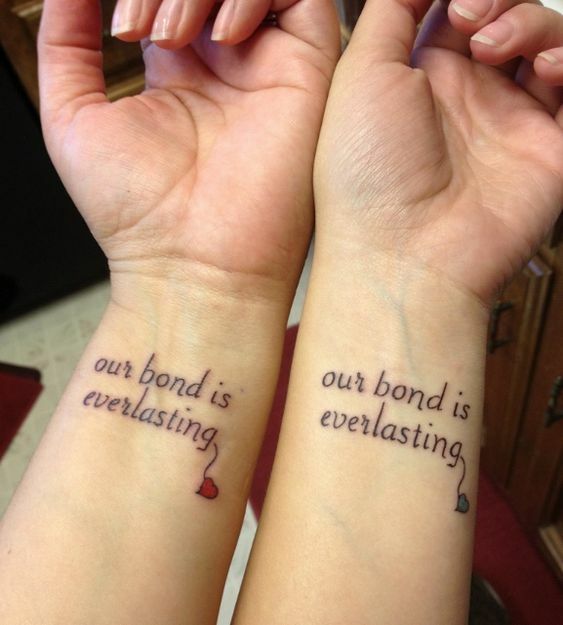 This is extremely cute and beautiful which says "Our bond is everlasting" with a tiny heart at the side. This actually describes the mother and daughter bond which is extremely beautiful. 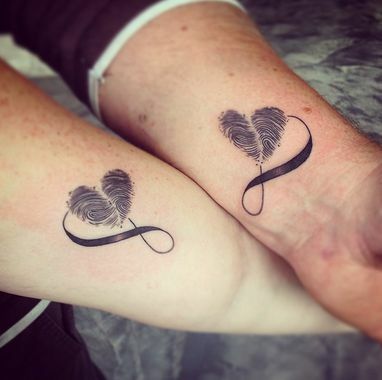 A heart has always been a favorite symbol when it comes to the world of tattoos. 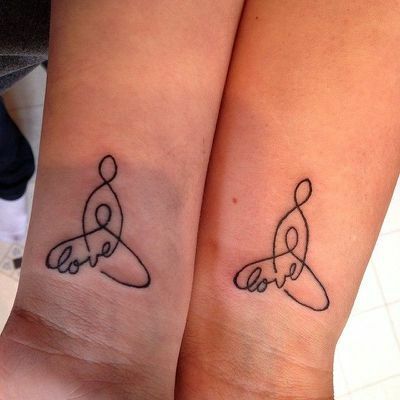 Now, how beautiful is this tattoo of two small hearts joined together? 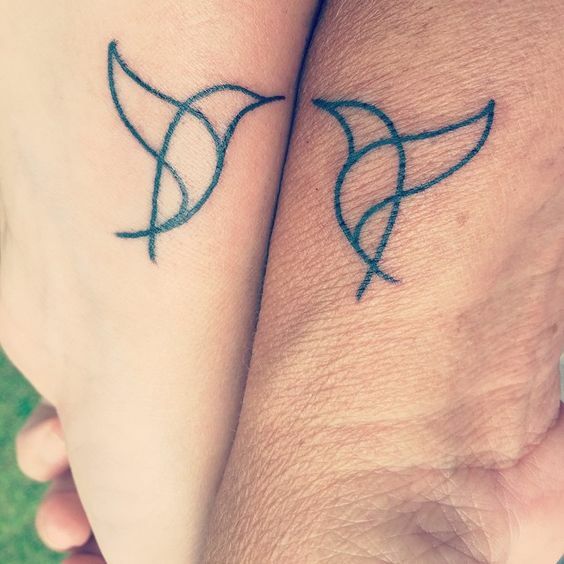 This tattoo is perfect for the mother and daughter as this shows how their hearts are always connected. 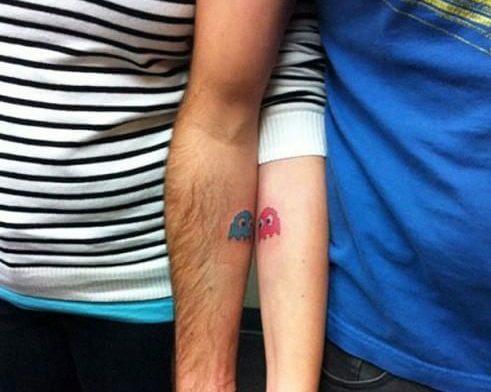 You can get matching tattoos anywhere on your body. Now, have a look at this beautiful tattoo which is at the back of the shoulders of mother and daughter. 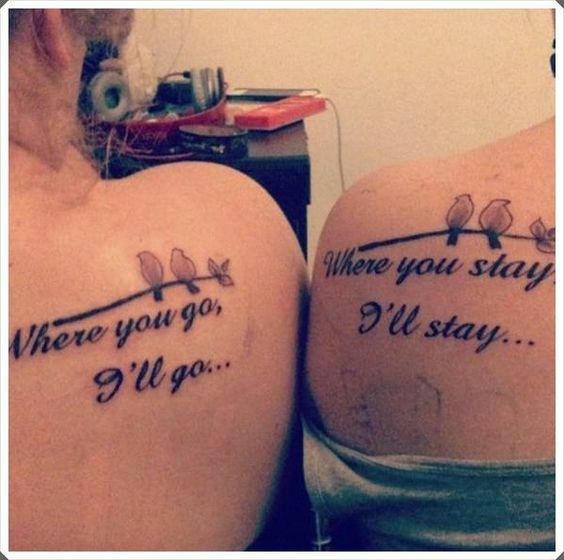 It says "Where you go, I'll go" on one's arm and the other says "Where you stay, I'll stay". 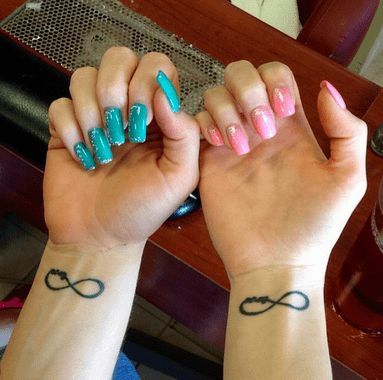 Infinity is the most cutest and the widely made tattoo symbol. As this symbol has a very deep meaning behind it so people are kind of obsessed with it. 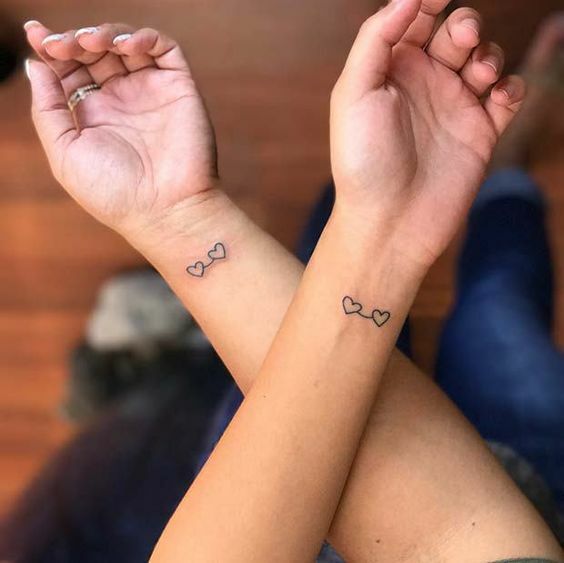 Now, look at these gorgeous matching tattoos of mother and daughter where you can see the infinity symbol but with a arrow head and tail at the beginning and end. All of us love cute cartoon figure as they are extremely adorable and can melt anyone's heart right? 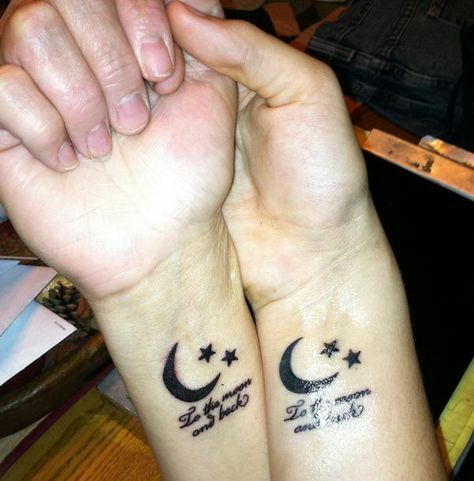 So, here is one such tattoo which helps you show your love in a more cute way. 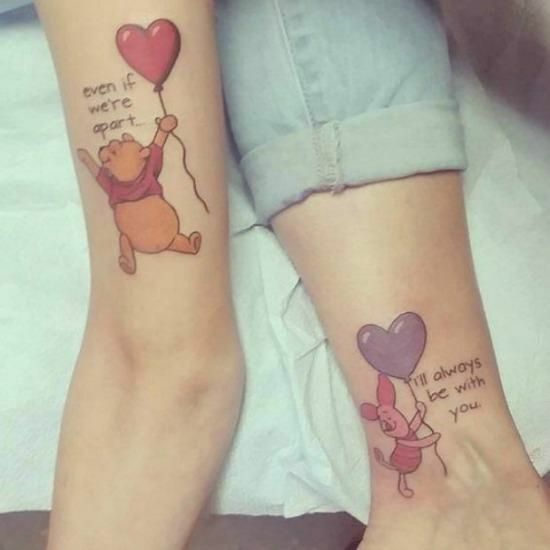 The tattoo says "I'll always be with you" with a piglet holding a balloon and the other tattoo where Pooh is holding a balloon says"Even if we're apart".